Skulls of Ovaherero and Nama people are displayed during a service attended by representatives of the tribes from Namibia in Berlin, Germany, Thursday, Sept. 29, 2011. About 60 Ovaherero and Nama traditional leaders and other officials arrived in Berlin, Germany to return about 20 skulls believed to be of Ovaherero and Nama people, killed by the then-German colonial forces during the resistance war in Namibia between 1904 and 1908. AP Photo/Michael Sohn. BERLIN (AP).- Namibian tribal leaders were taking possession Friday of the skulls of 20 of their countrymen, taken by German colonial forces more than a century ago for racial experiments. The handing over of the skulls is a rare reminder of Germany's short-lived past as a colonial power in Africa, which included the bloody suppression of a Herero and Nama uprising between 1904 and 1908 that left tens of thousands dead. The heads of four females and 16 males, including a young boy of about three, were removed from their bodies and preserved in formaldehyde intact with faces, skin and hair. Researchers say the skulls do not show any sign of violence, and it is not clear how the people died, though they were possibly victims of German forces in Namibia at the time, or died in a German-run camp. Once the remains arrived in Berlin, between 1909-1914, scientists tried to prove the "racial superiority" of white Europeans over black Africans by analyzing the facial features of the heads, said Thomas Schnalke, the head of the Berlin Medical Historical Museum. In the 1920s, the heads were further dissected until only the skulls remained. "It is our obligation to return the skulls and offer our apologies," Schnalke told The Associated Press before the ceremony. "It was wrong what they did." The Namibian government first asked for the return of the skulls in 2008, but it took several years to identify their origin. A delegation of 73 Namibian tribal leaders, government members and journalists arrived in Berlin earlier this week to receive the 9 Herero and 11 Nama skulls, and attended several ceremonies. On Thursday, Germans and Namibians came together for a religious ceremony at Berlin's St. Matthew's Church. 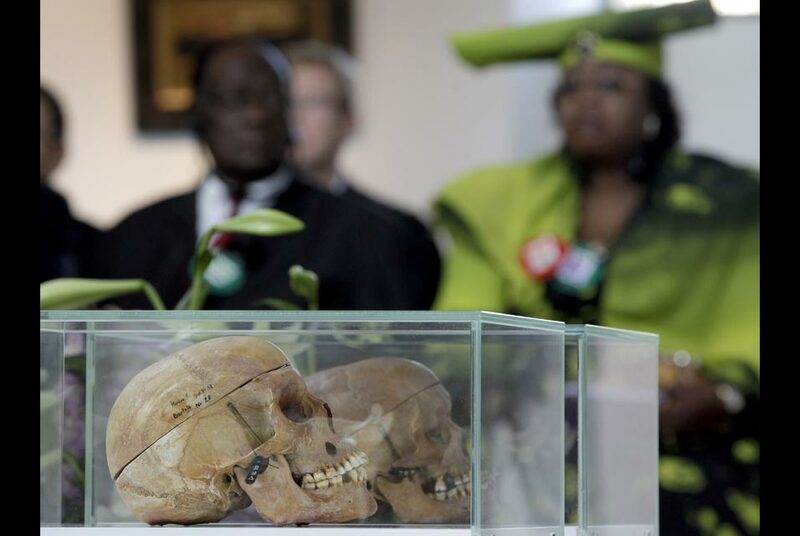 The 20 skulls were laid out in front of the altar, 18 of them in cardboard boxes draped with the Namibian flag, and two others in glass boxes facing the audience. Several members of the Namibian delegation stepped forward during the service to bow in front of the skulls, singing songs, reading prayers and crying as they begged farewell. "Today our hearts ache, but as we weep and condemn the evil, we are also grateful to restore the honor and dignity of our ancestors," Neville Gertze, the Ambassador of the Republic of Namibia in Germany said during the church service. According to Schnalke, Berlin's 7,000-skull collection may contain some more Namibian skulls, but so far these could not yet be identified with certainty. The museum will continue working on the identification and repatriate further remains once the results have come in, he said. In order to identify the skulls, scientists at Berlin's Charite University look at inscriptions on the skulls, see if they were catalogued at the time and whether there were any academic publications from the 1910s or 1920s referring to them, Schnalke said, adding that no DNA tests were carried out and that the scientists tried to treat the human remains as respectfully as possible. Berlin's Charite University a few years ago also signed a letter of intent with the Australian government to return the skulls of 18 Australian Aborigines, but so far their identification has not yet been concluded. The museum's efforts to return the skulls were supported by the German government, which has committed to help coordinate future efforts to return any other Namibian skulls that that might be identified in the future, the German Foreign Office said in a statement.